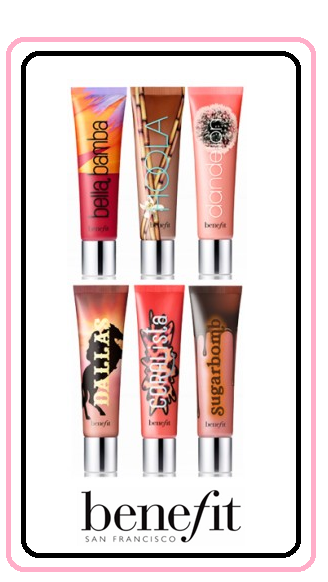 ❤❤My 1st Blog Giveaway❤❤ Win A Benefit Ultra Plush Lip Gloss Of Your Choice! I have reached 200 followers this morning, and I am so happy and grateful for all the support my followers have given me. Blogging has given me a place to help take my mind off my anxiety, as well as making many friends for life. I love getting new followers and comments, it means the world to me when you take the time to check out my blog. I wanted to say thank you by offering you the chance to win a "Benefit Ultra Plush Gloss" of your choice. I decided on this lipgloss because the box powders are so amazing, and I thought it would be great to give you a chance to try one of Benefit's latest products. I have also heard some really good things about these glosses, and I can't wait to try one myself. Benefit is an amazing brand which I have been using for a while now, and I must admit I am a sucker for the packaging!. i'd like to have the CORALista (sheer coral).. I'd love to try the Sugarbomb Plush Gloss! Yup! I used the widget! I just couldn't enter to the "easy entry on facebook" cause I'm not on facebook, haha! Wow well done on all the followers hun :) we share alot of interests when it comes to shoes and bags haha! Cool blog!What about following each other? the best giveaway ever! !i love that the winner has many choises! !i prefer bella bumba!! Sugarbomb because I like neutral colors! Can't resist a sparkly shade so I would go for Sugarbomb. Great giveaway and congrats on the followers. I would choose either Bella Bamba or Hoola! Lovely blog! Just found it and have been reading. Would love you to go check my beauty blog! What a lovely giveaway, congratulations on the followers! Come on by and join my Followers to Friends Blog Hop! A great way to meet new bloggers and gain followers! hey love I had already been following you lol <3 :) Thanks for checking out my blog though. hi, thanks for the great giveaway! If i won, i would go for a Dallas shade. I do hope the giveaway is open internationally. Amazing give away. Just discovered you and I love this blog. Graet Style. I follow your Blog now. I would choose Coralista because I love the blusher version! Hello! You have such a nice blog! Great giveaway! I would love Coralista or Bella Bamba! Such a good give away, love you blog!!! Oh my goodness I loovee benefit products! I have such a hard time deciding these things.. I'm going to just have to pick Dallas! fab giveaway! Hmm it's between Dandelion or Coralista,hmmm both stunning colours! I think I'll go for Coralista! i love the look of Dandelion, looks gorgeous! What a great giveaway :)!!! Great giveaway, I'd like Sugarbomb! Dallas seems most like my color :) Great giveaway and congrats! I'm with you on the packaging i just cant resist! Congratulations on your 200 followers! Coralista looks amazing, although I'm a sucker for coral type colours! I had to enter this for my love of the Coralista lip gloss! Fantastic blog my lovely. I have commented on quite a few of your posts today, promise i'm not stalking you! haha.